After meeting Max, I religiously began keeping up with his blog. And in April, I read that Max's cancer was progressing and he was having problems with urinary blood clots. I contacted Max's parents, Andy and Melissa, about photographing Max (with his siblings) again. I wanted them to have a formal photo session of Max. So on April 28th, we arranged to meet at Marion Bear Park. The Mikulaks arrived about 20 minutes late and I had forgot my phone so they had no way of contacting me to let me know. I waited. I would have waited an hour for them. When they arrived, they apologized for being late. They had to turn around because Max was having lots of pain in his legs and they needed to give him some more pain medication. I couldn't believe they apologized. They didn't need to apologize. I was like--are you kidding me. You shouldn't be apologizing to me for that. You were taking care of Max. Don't you dare apologize. He's the priority here..not me. During the session, Max marched, ran, jumped and climbed...no one would have known he was experiencing a single bit of pain. 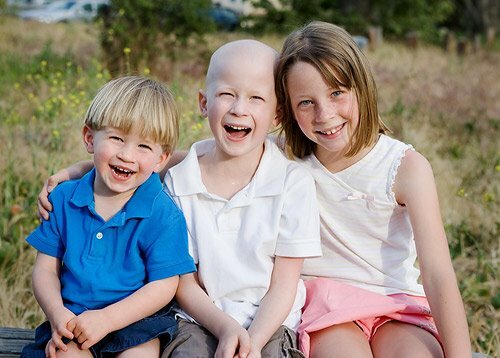 It's often a challenge to get three siblings together--looking and smiling for the camera. Well, not with the Mikulak kids. Max remembered from the first time I shot him...I peeked from behind the camera and said, "boo!". He asked me to do it again. I did. And when I did, he laughed hysterically. And so did Hannah and Nicky. Hearing Max laugh, I was even laughing at myself. He made my job so easy and made photograph the Mikulak kids so easy. After doing the group sibling photos, we moved on to doing individual shots. I asked Melissa if she was okay with Max taking off his shirt. Knowing that Max had a g-tube and port, I wasn't sure how she was going to feel about it but I wanted to treat Max like I would any other boy. I thought it would be fun to show Max making muscles b/c he's such a strong little boy. Well, Melis was all about it. 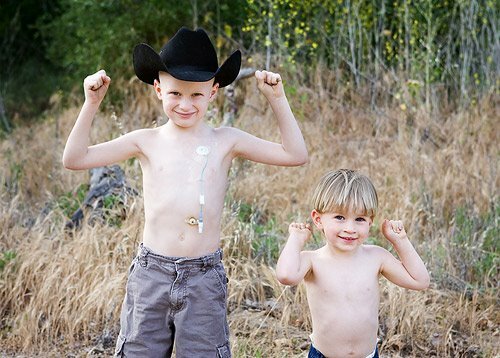 And it was so cute b/c when Max wore his cowboy hat, he was all about making tough guy cowboy faces. We also had a hat party, where we all wore hats. I adore this shot where Hannah and Nicky are looking at Max. 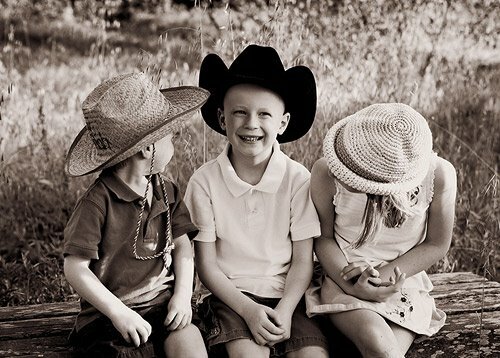 Throughout the session, it was so evident how much much Hannah and Nicky adore their brother. Max has this special, cute way of standing--back slightly arched and hands behind his back. It really is so adorable. And I was glad to be able to capture some shots of him doing that. In this shot, he's also giving me that special Max look that I seem to be getting at the end of the sessions. Okay. Maybe one more picture. And I'll give you a look but under my terms. 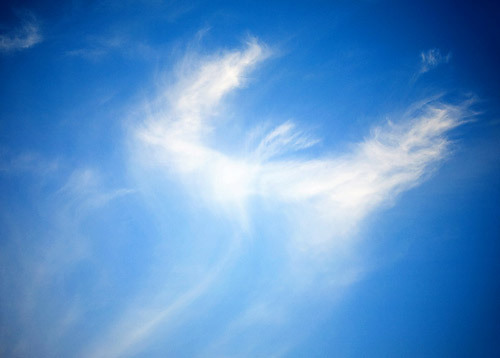 When the session was done, I looked in the sky and saw this angel in the clouds. It was at that moment, that I knew our journey together was so meant to be. Everyone who meets Max knows that he's an angel in disguise. And I thought that just maybe there was an angel watching over me during that session, to ensure that I got some good photos for the Mikulak family. I left and cried the entire way home. 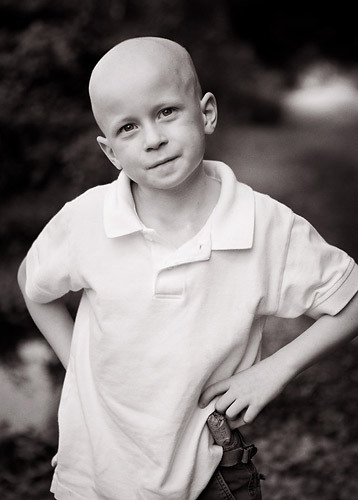 I just want Max to be healthy and free of this terrible disease that has invaded his body. What a great, great family. I've now had a number of inquiries to purchase a print of the angel in the clouds. Andy/Melis and I are trying to work out the purchasing details so that all proceeds from the sale of the print can go to Magic Water Project. Hopefully, the print will be available for purchase very soon. Little did anyone know that Max would be hospitalized that night for uncontrolled pain. When I read it on his blog, I sobbed. Why? Why? Why? Ow, what an encouraging example for other children and what an amazing blog. Max has this unique beuty of the childhood and we all must help him in his illness.